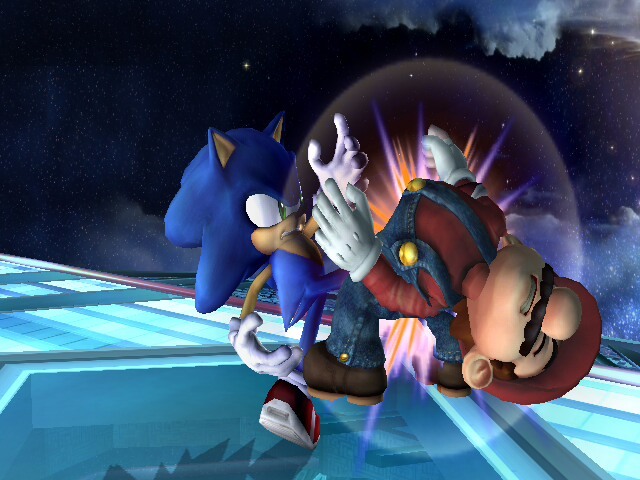 ^ The best thing about Super Smash Bros. Brawl was finally seeing these enemies bash seven shades out of each other. I've not made a lot of enemies in my life, nor do I intend to. I very rarely hold grudges and generally can't be bothered to invest genuine emotional energy in disliking someone as much as to even call them an "enemy". But every once in a while, you will meet someone who you simply do not click with. Not only that, but they actively offend you by their mere presence. And, granted, you offend them in a similar manner. In each other's eyes, you are nothing but a Berkosaurus Rex waiting for extinction. That's fine. You can't get along with everyone. Hopefully, you'll never run in to each other and just generally stay out of the other's life. You'll ignore one another and everything will be dandy. But sometimes life just isn't that easy. Sometimes you're forced in to a situation where direct contact with your figure of hatred is not only obligatory, but necessary. Most of the time, this is a difficult affair where both parties try their hardest to bite and dullen sharpened tongues. After all, you don't want to make your shared acquaintances uncomfortable just because you two have some petty and nonsensical feud. That's just unfair on them. This situation is always made one hundred times worse when one party doesn't get the position they're putting everyone else in and immediately proceeds to make rude comments at their enemy's expense. The antagonistic commentary doesn't serve to belittle their enemy however. Rather, it just cements them as an utter whore for drama whose own deluded sense of self-worth grossly overpowers their ability to use tact and self control in the interest of not placing friends in an intensely awkward situation. It's nothing but sheer karma when their target responds with nothing but civility, as the perpetrator has just made a fool of themselves in front of all their own friends. Well played, you nuclear numbskull. If you're going to hate someone, at least learn to do it without making other people think you're a spiteful cow, eh?